Bilderberg, operating under the guise of “free market capitalism,” represents instead the complete culmination of banking corporate world control. Presented as yet another debate forum, the secretive meetings instead have been revealed in numerous cases to have driven global policy. The most shining example is the 1955 Bilderberg meeting’s plans for the creation of the “European Common Market” and “European Union (Unity) shown below. It is important to recall that the European Common Market came into play some three years later in 1958, while the European Union itself was supposedly founded in 1993. With this in mind, we can see how the TTIP is simply a further extension of the same strategy of economic integration, from the EU to NAFTA. Considering the years of propaganda surrounding Iran and its nuclear program, it was clear to any informed observer that the recent US-Iran nuclear deal was nothing more than theatre. After all, the US/NATO imperialist machine has made its desire to wage war on the Persian nation explicit for some time. The only question is just how long this theatre will last before that goal is finally realized. While the Western press and corporate media outlets have taken to presenting the Iran nuclear deal as either a tragic capitulation to the deadly warmongering Iranians or a brilliant lunge for peace with the deadly warmongering Iranians, the premise of their presentations are exactly the same – that Iran is dangerous, wants war, and is doing whatever it can to acquire a nuclear weapon. This is, of course, despite the fact that there is no evidence that Iran is attempting to gain a nuclear weapon or has any aggressive intent in the region. In fact, the US and Israeli intelligence organizations have both determined that Iran does not have a nuclear weapon nor is it attempting to acquire one. Indeed, it has been admitted by military industrial complex firm, The RAND Corporation, that Iran’s military capabilities were largely defensive, not offensive. Even further, not only was Iran well within its rights to do everything it was doing in regards to nuclear energy and technology, the agreement signed with the West was an extraordinary act of conciliation and cooperation. Indeed, Iran bent over backwards to appease the West in its imperialists aims. That being said, I have argued from the very beginning of the US-Iran nuclear talks that the diplomacy taking place was nothing more than theatre to be used later in the rush to war as evidence that the US did “everything in its power” to avoid confrontation. While the future is impossible to predict, one might reasonably believe that the US will soon sabotage the nuclear deal whose final touches and signatures are due at the end of June 2015. Tune in to the Alternate Current Radio Network tonight for another episode of ‘The Boiler Room’ with its new 2 hour format, with the LIVE broadcast starting at 11:00 PM-1:00AM EST, or 8:00 PM-10:00PM PST. Join us for this brand new uninterruptible talk radio program, custom-designed for news hounds, media-maniacs, savants, exotic political animals and otherwise loveable social rejects. This week’s topics: Garland TX Shooting, ISIS, foundations, think tanks, Baltimore, Chemtrails, JADE HELM 15 and more. On January 31, he stepped down as Fed chairman. Janet Yellen replaced him. He’s entering a new world of million-dollar book deals. He’ll make $100,000 a pop speeches. Expect appointments to corporate boards. CEOs value his rainmaking services. He’s a “Distinguished Fellow in Residence.” He’s affiliated with the Hutchins Center on Fiscal and Monetary Policy (HCFMP). On January 16, Brookings launched it. Its board of trustees vice chair Glenn Hutchins contributed $10 million in seed money. He co-founded the multi-billion dollar private equity firm Silver Lake Partners. Guess what type policies HCFMP will endorse. “We are proud to welcome chairman Bernanke into the Brookings family,” said president Strobe Talbot. He’s Clinton’s former deputy secretary of state. He was directly involved in some of his worst policies. Brookings’ agenda is brazenly imperial. It’s pro-corporate. It’s anti-populist. It feigns concern about inequality. It supports government of, by and for privileged elites alone. Expect Bernanke to fit right in. His Fed tenure was deplorable. He betrayed the public trust. His record attests to his wickedness. His agenda was ruthlessly anti-populist. He did more to thirdworldize America for profit than any of his predecessors. He handed Wall Street crooks multi-trillions of dollars. He facilitated the greatest wealth transfer in history. He created a protracted Main Street Depression. No end in sight looms. What the UN report on Syria will say & what the liars in the West will claim it says. Ban Ki-moon made no comment on who was to blame for the 21 August attack in the Ghouta area of Damascus, as that is not part of the report’s remit. Despite this, the United States and its axis of collaborators are already trying to spin the report as confirmation that the Syrian government was responsible. Relying entirely on the momentum of its massive media networks and their ability to “will” reality into any shape they please, headlines such as “United Nations’ Syria chemical weapons report “overwhelming,” shamelessly attempt to link two out of context statements by UN Secretary General Ban Ki Moon regarding the Syria government’s “crimes against humanity” and the confirmed use of chemical weapons in Damascus Syria, to place in the mind of readers assigned blame for the attacks. In reality, the UN inspectors that were stampeded out of Damascus in the middle of their work, fearing an impending unilateral US military attack, were only attempting to determine how victims in eastern Damascus died, not who killed them. Independent assessments of who was responsible for the attack have not been carried out. The best the US has been able to do is suggest terrorists operating in Syria were incapable of such an attack, leaving only the Syrian government as a possible suspect. Militant groups operating inside Syria with Western “contractors” (read: mercenaries, see: Blackwater) are more than capable of handling and deploying the weapons, and therefore more than capable of carrying out the attacks in question. The only argument left for the US is whether or not these militants, aligned with Al Qaeda, possess the will or motivation to do so. That doing so and framing the Syrian government would serve as impetus for direct US military intervention and therefore the salvation of the crumbling militant offensive, is more than motivation enough. And while Secretary General Ban Ki Moon’s comments were taken out of context, that he has seemingly failed to also call for accountability of Syria’s so-called “opposition” smacks of partiality – partiality exhibited by the UN throughout the Syrian conflict. Additionally, the UN’s failure to question who in fact is arming, funding, and logistically supporting verified terrorist organizations within and around Syria’s borders is equally troubling. Could the UN be so out of touch with reality that it doesn’t realize an operation of this scale surely is state-sponsored, and that the question of who is funding, arming, and otherwise supporting such an extensive operation never seemed important enough to publicly ask? Examining the UN’s role in the Syrian crisis must also include its 2011 UN Human Rights Council’s report (full text .pdf), and its most recent report published August of this year (.doc). These are nothing more than a collection of “interviews” conducted abroad with “witnesses” provided by Syrian “opposition groups” and alleged defectors, augmented with fabrications and biased spin provided by Western-funded “NGOs” openly working for armed militants inside Syria. 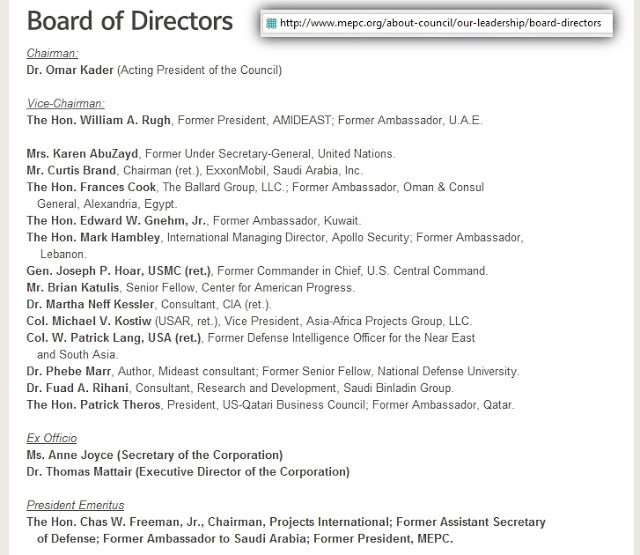 Image: Screenshot from the Washington D.C.-based Middle East Policy Council’s board of directors from which the UN has drawn Karen Koning AbuZayd as head of their recent “expert panel” on Syria. With fellow board members representing the collective interests of the American and Gulf State corporate-financier interests currently underwriting armed militants inside Syria, the conflict of interest resigns the legitimacy of the report – based entirely on “interviews” – as well as the legitimacy of the UN itself. The UN panel for the 2011 report and the more recent 2013 report were co-headed by Karen Koning AbuZayd, a director of the US Washington-based corporate think-tank, Middle East Policy Council. Its board of directors includes Exxon men, CIA agents, representatives of the Saudi Binladin Group (Osama Bin Laden’s family business), former ambassadors to Kuwait, Oman, and Qatar, US military and government representatives, and even the president of the US-Qatar Business Council, which includes amongst its membership, AlJazeera, Chevron, Exxon, munitions manufacturer Raytheon (who supplied the opening salvos during NATO’s operations against Libya), and Boeing. 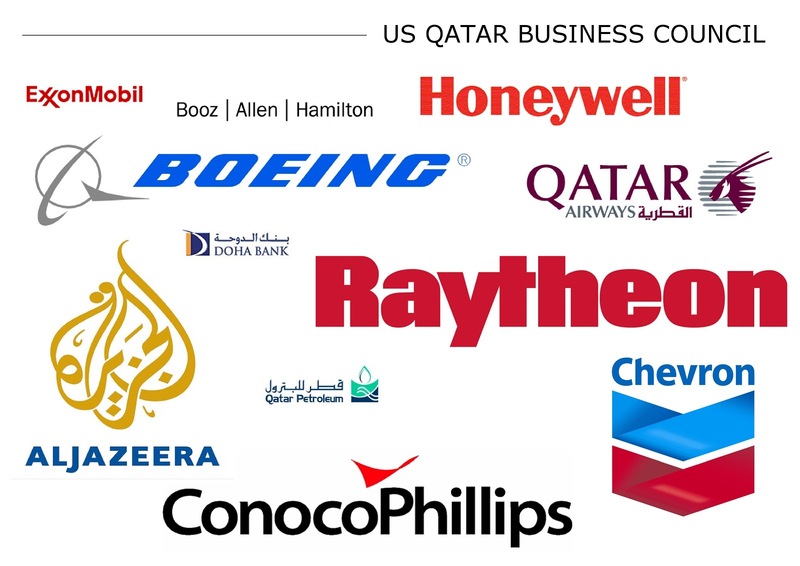 Image: Just some of the corporate members of the US-Qatar Business Council, whose president just so happens to sit on the same board of directors of the Middle East Policy Center as Karen AbuZayd, co-author of, now multiple, conveniently timed UN reports on Syria. The UN is a diverse organization with both impartial and overtly biased interests busily at work. The utility of the UN’s statements, reports, and investigations must be determined not by the rhetoric that surrounds them, spun either by the Secretary General himself or by media organizations abroad, but rather by whatever solid, verifiable evidence that may be present, if it is indeed even present. The 2011 and 2013 UNHRC reports are throw-away propaganda based solely on biased hearsay. The most recent UN report regarding the August 21, 2013 chemical attacks in Damascus, according to the UN itself, DOES NOT ASSIGN BLAME, but merely confirms that chemical weapons were used – a point that is not contended by either side of the conflict. This point above all else, must be kept in mind ahead of a predictable barrage of propaganda by faltering Western interests determined to use the UN report to “confirm” their wholly rejected conclusions and prescribed solutions regarding Syria. Tony Cartalucci’s articles have appeared on many alternative media websites, including his own at Land Destroyer Report, Alternative Thai News Network and LocalOrg. Read other contributed articles by Tony Cartalucci here. Tonight, on History So it doesn’t Repeat: We ask the question: Is America safer, now that we’re openly being spied on? We’ll discover how to check our premises, and peer into the origins, form, and function of the intelligence Community. By studying those who spy on us, we’ll uncover the root-causes of the War on Terror; and you will have the facts to help end it. Learning’s the Answer, What’s the Question? It’s all coming up next, on History So It Doesn’t Repeat. Jan Irvin’s publications can be found at http://www.GnosticMedia.com and both he and Kevin Cole are members of the T&H online research and development community. Tragedy and Hope provides a portal through which individuals can discover, identify, and integrate useful tools, resources, and activities which stimulate and fortify Cognitive Liberty, providing primary sources, research, and educational methods which facilitate consciousness. Tragedy and Hope’s purpose is to enable individuals to research and form groups of independent thinkers to solve humanity’s most pressing problems, by identifying the etiology (study of the cause-and-effect origins) and thus understanding our way toward the solutions we seek. Tragedy and Hope’s form and function (free to the public) enables hundreds-of-thousands of people around the world, to experience open-source education without upper-limits, and it is therein where the solutions are discovered- by making the problems truly known and understood at a root-cause level. Tragedy and Hope is funded by those who tune-in to our productions, and the members of the Tragedy and Hope online critical thinking and research community, who subscribe after witnessing the value provided, and voluntarily deciding to contribute in a way to ensure we can continue producing educational media with integrity and consistency. Sacrifice the Tragedy, Preserve the Hope. T&H: Re-Contextualizing History one Episode at a Time. December 21, 2012 (LD) – As early as 2007, it was reported that the US, Israel, and Saudi Arabia, together were not only organizing, funding, training, and arming militants directly linked to Al Qaeda to be used against Syria and Iran, but knew well in advance that by doing so, they would trigger an unprecedented “cataclysmic conflict” driven by sectarian extremism. Not only was such sectarian violence expected, it was desired ahead of redrawing a new map for the Middle East – one that favored Western corporate-financier and geopolitical interests, while keeping the region weak, divided, and infighting. The UN once again is abusing its own self-appointed authority by excusing and spinning premeditated sectarian genocide designed to advance a documented conspiracy admitted to years ago. More recently, this conspiracy to destroy Syria through engineered and purposefully protracted violence was documented further by the very corporate-financiers themselves amongst the pages of reports turned out by their own policy think-tanks. “The United States might still arm the opposition even knowing they will probably never have sufficient power, on their own, to dislodge the Asad network. Washington might choose to do so simply in the belief that at least providing an oppressed people with some ability to resist their oppressors is better than doing nothing at all, even if the support provided has little chance of turning defeat into victory. Alternatively, the United States might calculate that it is still worthwhile to pin down the Asad regime and bleed it, keeping a regional adversary weak, while avoiding the costs of direct intervention.” –pages 8-9, Assessing Options for Regime Change, Brookings Institution. Such documents completely contradict the public statements issued by the West, which attempt to portray their involvement in Syria as motivated by “humanitarian concerns,” “moral imperatives,” and the “promotion of democracy.” In reality, the goal is to prolong the violence as long as possible, expedite the loss of life, and to destroy the nation by fueling violent militants – just as it was the plan in 2007 when Hersh penned “The Redirection.” The sectarian component of the current conflict is not an unexpected result of violence that began only in 2011, it was an integral part of the West’s foreign policy since 2007. The sectarian genocide in Syria was purposefully engineered by Western policy makers, and now is willfully covered up, spun, and excused by the UN and the Western mass media alike. Repost: Saad Hariri Aides Western Syria Destabilization from Lebanon. October 20, 2012 – It was, starting at least in 2007, the goal of the US, Saudis, and Israelis to trigger a region wide sectarian war with which to overrun the governments of Lebanon, Syria, and Iran. This was documented in detail in Seymour Hersh’s 2007 New Yorker article, “The Redirection” which was covered in depth in, “Syrian War: The Prequel. A recent bombing in Beirut, Lebanon left high ranking security chief Brigadier General Wissam al-Hassan dead. Al-Hassan is described as “anti-Syrian.” Before Al-Hassan’s death was announced, and literally as bodies were still being pulled from the wreckage caused by the bombing, politicians from Saad Hariri’s faction began immediately blaming Syria for the attacks. Hariri himself also laid the blame on Syria, offering no other details or supporting evidence. 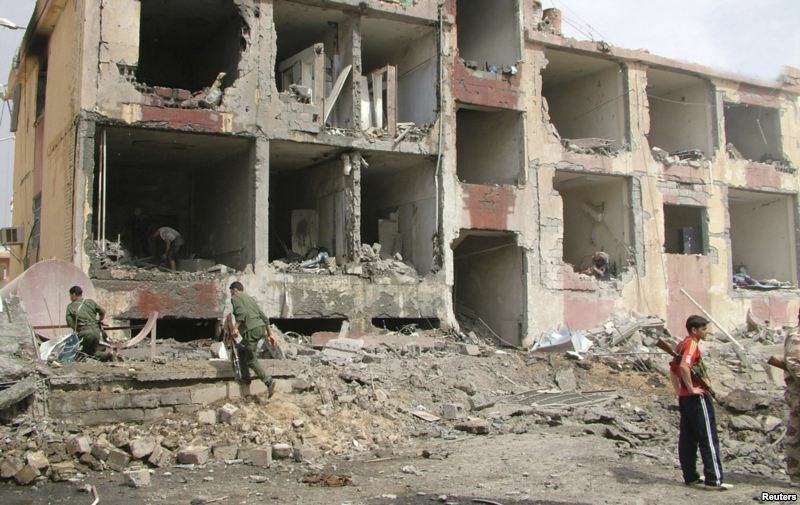 Hezbollah, Syria, and Iran have all condemned the bombing and cite it as a provocation to start a greater sectarian war, from which none will benefit. Each in turn suspect Israel and the West, as greater sectarian tension is expected to result, playing into long documented attempts by US, Israel, and Saudi Arabia to trigger a sectarian war they hope will be the downfall of Hezbollah, Syria, and Iran. Suspicious op-eds in pro-Western “Lebanon Now” insist that Syria is responsible, and again without evidence, concludes that blaming Israel is inappropriate, and that the Wall Street-London militant beachhead is by far a lesser threat to Lebanon than what it calls “the most deadly virus” of President Bashar al-Assad’s Syria. Hariri in 2007 was, according to US journalist Seymour Hersh, building an armed militant front in northern Lebanon, across the boarder from Homs, Syria. Many of these militants admittedly had direct ties to Al Qaeda, and with US, Israeli, and Saudi support, they were continuously armed, funded, and prepared for the sectarian bloodbath now unfolding. Homs to this day remains as one of the strongholds for terrorist militants operating in Syria. While the Western media claims it is a shocking revelation that Al Qaeda is “amongst” the fighters attempting to overthrow the Syrian government, it is well documented that it was Al Qaeda from the very beginning who began armed operations against Syria, using Lebanon and Turkey as a base of operations, with explicit support from the West. The operations were carried out under the tenuous cover of “pro-democracy” protests and with a constant torrent of disinformation provided by the Western media. While the current story in Lebanon develops, it will be useful to understand the role Hariri has so far played. The republished article below, originally posted in May, 2012, is by no means an exhaustive expose of Hariri and his role in executing the foreign agenda driven by Wall Street, London, Tel Aviv, Doha, and Riyadh, which starts well before 2007. Originally posted May 21, 2012 -The United Nations has been inexplicably silent over revelations that the United States, Saudi Arabia, and other Persian Gulf states, are arming militants in Syria in direct violation of a UN brokered ceasefire. Additionally, the US has openly threatened to arm Kurd militants in Syria to “rise up” against the government. While in reality this constitutes a greater threat to neighboring Turkey, and perhaps an attempt to motivate Ankara to take a more aggressive stance against Syria, the threat of purposefully inciting more violence in a conflict that has allegedly claimed “10,000” lives, seems not only grossly irresponsible, but a violation of international peace. Image: A bomb detonates in Syria, May 19, 2012, killing and maiming scores. This is the latest manifestation of overt US and Gulf State military support for terrorists attempting to destabilize and overthrow the Syrian government. The West has planned and prepared years in advance for implementing bloody regime change in Syria and Iran. The West’s meddling in Syria does not end there. Recently, clashes have broken out in Lebanon, revealing a large base of operations supporting the destabilization in neighboring Syria, located along the Lebanese-Syrian border. The significance of this discovery, and extremist groups in Lebanon being directly involved, highlights the veracity of a 2007 New Yorker article by Seymour Hersh titled, “The Redirection,” which exposed a joint US-Israeli-Saudi operation to create a violent extremist front and direct it at Hezbollah in Lebanon, President Bashar al-Assad in Syria, and at the Iranian government. It becomes clear then that Lebanon’s recent unrest is a result of a greater gambit targeting not just Syria, but the Hezbollah-Syrian-Iranian sphere of power, following the US-engineered “Arab Spring” installing proxy leaders across the Arab World to specifically support this last leg of geopolitical reordering. Such support has manifested itself as political support from US-proxy president Moncef Marzouki of Tunisia, and similar support from US-installed Libyan Prime Minister Abdurrahim el-Keib, who’s nation has also committed not only arms and cash to Syrian terrorists, but fighters as well. Image: Saad Hariri, former prime minister of Lebanon, is admittedly a co-conspirator in US-Israeli-Saudi designs to destabilize with militant extremists and violently overthrow the Syrian government. 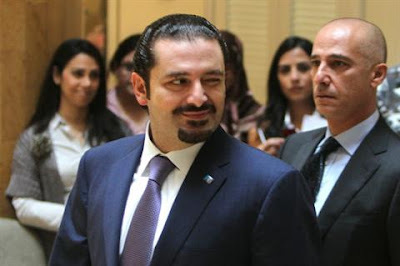 While Hariri feigns anti-Israeli sentiment and makes public calls for Lebanese to refrain from sectarian violence, he is the primary facilitator of both extremists crossing over into Syria, and their creating of chaos in the streets of Lebanon. A 2010 Fortune 500-funded International Crisis Group report describes in detail Hariri’s deep ties, and indeed dependence, on the West. Now, it is reported that “anti-Assad clerics” have been shot by Lebanese soldiers – and just as was seen during the assassination of Rafic Hariri, demagogues are attempting to draw Sunni Muslims into a conflict with Shi’ias. A strategy of tension is being used to divide the Lebanese people into a deadly conflict mirroring the sectarian, not “democracy,” driven unrest ravaging Syria. With Saad Hariri, the US, and Saudi Arabia overtly working to undermine Syrian stability, it appears that all of the characters described by Hersh in 2007 are now openly implementing their plans. The purposefully nebulous coverage by the Western media over violence in Lebanon so far, and a disingenuous depiction of it being “spill over” from Syria is meant to portray a general sense of chaos consuming the region. In reality, it is a premeditated destabilization dependent on fostering violence between Sunni and Shi’ia Muslims, just as was purposefully done in Iraq to balk an effective Sunni-Shi’ia alliance that achieved initial success fighting a foreign occupation led by the US starting in 2003. While exposing the premeditated nature of the destabilization consuming Lebanon and Syria is essential, as well as calling for international condemnation of the US for openly attempting to escalate violence in the middle of a mediated ceasefire, calling on people across the Islamic World to refrain from falling into this sectarian trap, and being used as tools of their own division and subjugation by the West is equally important. Mark Dice talks with Abby Martin, host of Breaking the Set on RT about Elite Think Tanks and how they manupulate American foreign policy. Mark Dice is a media analyst, political activist, and author who, in an entertaining and educational way, gets people to question our celebrity obsessed culture, and the role the mainstream media and elite secret societies play in shaping our lives. Check out Mark’s books in paperback on Amazon.com or e-book on Kindle, Nook, or Google Play. Mark Dice appears in several documentary films including Invisible Empire, The 9/11 Chronicles, and has been featured on the History Channel’s Decoded and the Sundance Channel’s Love/Lust: Secret Societies and more. He enjoys enlightening zombies, as he calls them, (ignorant people) about the mass media’s effect on our culture, pointing out Big Brother’s prying eyes, and exposing elite secret societies along with scumbag politicians and their corrupt political agendas. You can support Mark’s work by sending a PayPal donation to Donate@MarkDice.com or by using the Donate link on MarkDice.com. He has called into several top-rated talk shows dozens of times, including the Sean Hannity Show, Glenn Beck, and Michael Savage, and verbally battles with the hosts on various issues since he has never been asked to be a guest on them as of yet. Audio of some of these calls are then posted online. Mark Dice is the author of several books on current events, secret societies and conspiracies, including his newest book, Big Brother: The Orwellian Nightmare Come True which is available on Amazon.com, Kindle and Nook. While much of Mark’s work confirms the existence and continued operation of the Illuminati today, he is also dedicated to debunking conspiracy theories and hoaxes and separating the facts from the fiction; hence the “Facts & Fiction” subtitle for several of his books. He has a bachelor’s degree in communication. US corporate-funded Brookings 2009 report conspires against the nation of Iran. Plot includes using terrorists, provoked war, economic warfare, and covert military and political subversion against the Iranian people. Update: October 4, 2012 Brookings has moved around their documents, leaving dead links for anyone who cited them over the years. All documents cited by Land Destroyer will now be hosted online using Scribd, and linked to that way. Editor’s Note: October 3, 2012 – Brookings has taken down their .pdf reports, leaving dead links. The “Which Path to Persia?” report has been so frequently referenced it would be impractical in the short term to fix all the dead links. Instead, the report is being presented in full below, via Scribd. For a full analysis of the document please see “Which Path to Persia?” Part I and Part II.